Tomorrow could be a substantially big day on the southern plains. The threat conditionally exists for strong tornadoes, very large hail and damaging winds. Time to break it down. It’ll be quick.. I need to sleep! The upper level low/trough is sitting out near the 4 corners region and is expected to move east. A lead wave set off multiple areas of convection tonight and these storms continue. There is not substantial outflow, but quality moisture has been shunted south into Texas. Just how far north this moisture can return will be one key to tomorrow. The deep tough over the southwestern US will begin to eject out into the plains overnight into tomorrow afternoon. In advance of this, height falls will overspread the region, leading to surface cyclogenesis. Theta e advection will commence this evening and will yield elevated showers and storms across much of the Texas Panhandle into western Oklahoma. This is a different scenario than last night, which featured a lead wave, in addition to convection with substantial outflow ongoing. As long as the convection remains elevated and can move off eastward, the overall severe threat should not be substantially modulated by this convection. One caveat though is the moisture return that can occur, with the true warm sector shunted southward into Texas tonight. The dryline should sharpen in the afternoon with increasing cyclogenesis and moisture advection. Most evening models seem to allow for substantial instability to develop in the wake of morning convection. This appears to be a likely scenario. Depending on the evolution of overnight convection, the degree/speed of recovery may be just a bit overdone, but we will know in the AM. 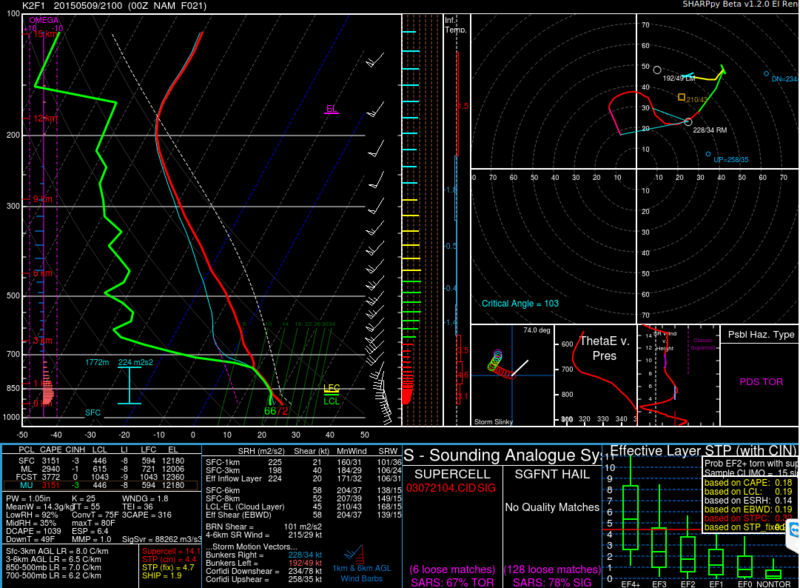 Though there is some convective contamination (means the model thinks there is a storm nearby) causing some weird moisture profiles, this sounding looks decent, except the veer back veer wind profile, but this looks fairly widespread across the warm sector, near the dryline, except maybe a bit further south into TX, near and south of the Red River. Tomorrow isn’t a slam dunk.. I feel the best low level shear is going to be north.. However veer back veer wind profiles, plus the potential for modulated destabilization and weaker moisture return lead me to believe I will end up a bit further south tomorrow. That said, I bet a tornado report comes in somewhere up in KS nearer to the low. I hope on the southern end, we can get some decent instability/moisture and get a few beefy supercells along the dryline. Some evening high res convection models are dry across the southern target. I am not sure if this is a lack of convergence, or substantial subsidence in the wake of morning activity, but I would expect at least widely scattered coverage on the dryline. I think I will likely head west on 40 in the late morning early afternoon period then decide. 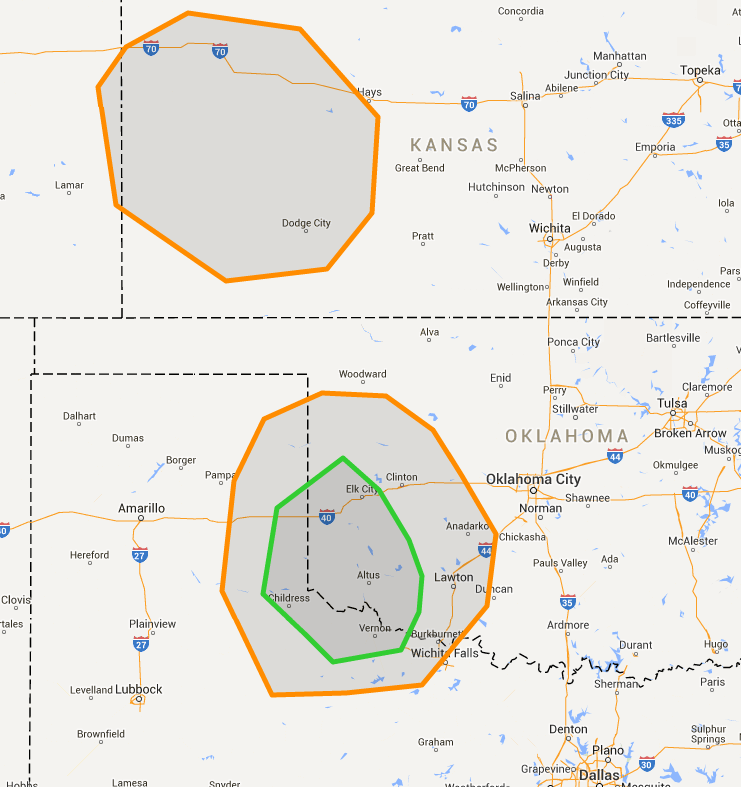 I would say a preliminary area is Childress, TX to Clarendon, TX.